Mulan is a 1998 American animated feature film produced by Walt Disney Feature Animation, and released by Walt Disney Pictures on June 19, 1998. 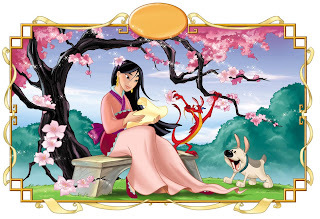 The thirty-sixth animated feature in the Walt Disney Animated Classics, and a part of the Disney Renaissance, the film is based on the Chinese legend of Hua Mulan. Inspired by a familiar Chinese folk tale, this $90 million animated Disney drama follows the adventures of a young woman in ancient China. While the merciless Shan-Yu (Miguel Ferrer) leads invading Huns over the Great Wall, young Mulan (Ming-Na Wen, with singing by Lea Salonga) sees a matchmaker about her matrimonial future. Mulan's views on accepted marriage traditions prompt the ballad, "Reflection," as she hopes for a recognition of her true self. To repel the Huns, a man from each family is required to join the Imperial Army. When Mulan's elderly father Fa Zhou (Soon-Tek Oh) volunteers, she objects. He warns, "I know my place. It is time you learned yours." Mulan, however, cuts her hair, dresses as a man, and is ready for military camp, prompting the concern of her First Ancestor (George Takei), who converts an inanimate incense burner into the 18-inch high comedic dragon Mushu (Eddie Murphy). With Mushu hidden in her clothing, she joins a group of raw recruits under the command of Captain Shang (B.D. Wong, singing by Donny Osmond). During an ambush by the Huns in a mountain pass, Mulan steps in to turn defeat into a victory. This is my first choice too. No rule on picking something else even if someone else picked it already... i hope. Little Mermaid is really famous. I love that Lea Salonga sang in this movie too. uy..pwd ra kau na parehos uy.murag daghn mn gyd ganahn sa Little Mermaid. An unconventional Disney princess but unforgettable and great nonetheless. that's what makes Mulan very appealing. thanks for joining this week mommy hazel, and my apologies for the very late comment. hope to see you again next week for a robot/cyborg movie. hugs! hala mali! it should be mommy phebie. naglibog ko which am i commenting kay daghan kaayo open na tabs on my browser. sorry for that dear phebz!